After an unusually cool spring, temperatures began to climb to near normal in central Washington during the month of June. The lingering impacts of La Niña that were experienced during winter and spring appeared to be fading away with the arrival of summer and ENSO neutral conditions in the equatorial Pacific Ocean. Despite the warming conditions, however, June temperatures remained slightly below average. 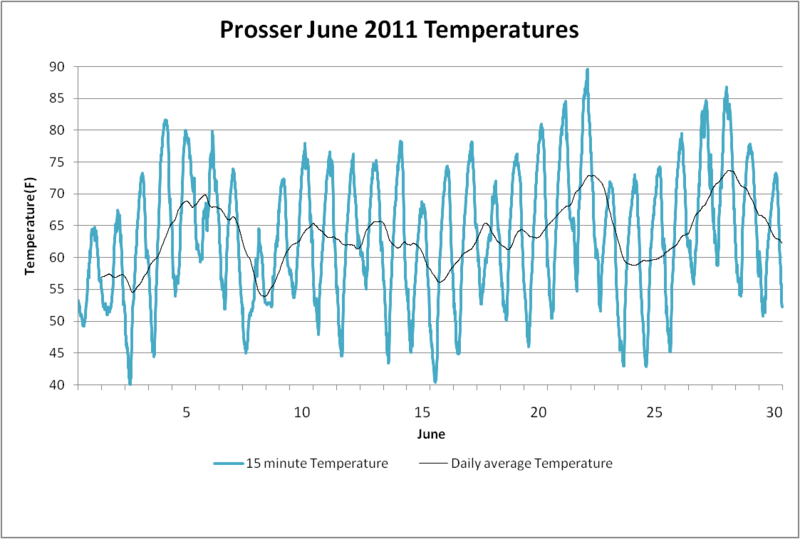 The average June temperature at Prosser (WSU HQ) was 63.3°F, which was approximately 2 degrees (one standard deviation) below the 1990 to 2011 average. The highest recorded temperature at the Prosser site was 89.6°F, which was 4.5 degrees below the typical maximum June temperature, and far from the June record of 105.1°F set in 1992. The coolest June temperature (40.1°F) was near the normal monthly minimum, and well above the record of 35.3°F set in 1999. Precipitation for June at Prosser was 0.17 inches, while the maximum 15 minute wind speed and wind gust were 17.1 mph and 29.6 mph, respectively, with a monthly average of 4.7 mph. Elsewhere, temperatures were one and a half degrees below average in Moxee (62.5°F), and precipitation was 0.12 inches, with a maximum wind speed (gust) of 20.3 mph (28.6 mph). AgWeatherNet's WSU Mt. Vernon weather station in western Washington featured a June average temperature of 57.4°F, which is about one degree (0.6 standard deviations) below normal*, and the monthly precipitation total was 0.91 inches. The maximum sustained wind speed and gust for June were 11.9 mph and 18.2 mph, respectively. The overall weather pattern appears to be returning to a more typical regime of warm and sunny summer weather, as we enter the driest season of the year. The spring trend of cool but moderate temperatures continued as the warmest June temperatures at three AWN sites were well below normal, while the coolest temperatures of the month were near normal. June was consistent with March, April, and May in that it was characterized by the lack of sweltering heat rather than the presence of record cold. During June of 1992, the average temperature of 71.2°F in Prosser was 5.6°F (2.7 standard deviations) above normal. *The period of record for WSU Mt. Vernon is 1994 to 2011, and excludes 1996 due to missing data. **The warmest temperature recorded in June of 2011 at Moxee was 86.7 degrees, which is the lowest June maximum temperature on record.